It is beautiful and fascinating to watch people use sign language. All the words, letters, expressions wrapped up in not vocalization, but the movement of the hands. It can be done quite beautifully for music and if done properly, even though you may not understand what is being said, you still get a sense, a feeling of the message being conveyed. In contrast, have you ever watched two people who are separated by a bit of distance in a noisy room trying to communicate with one another? It looks a bit silly. Like a game of charades gone terribly wrong. 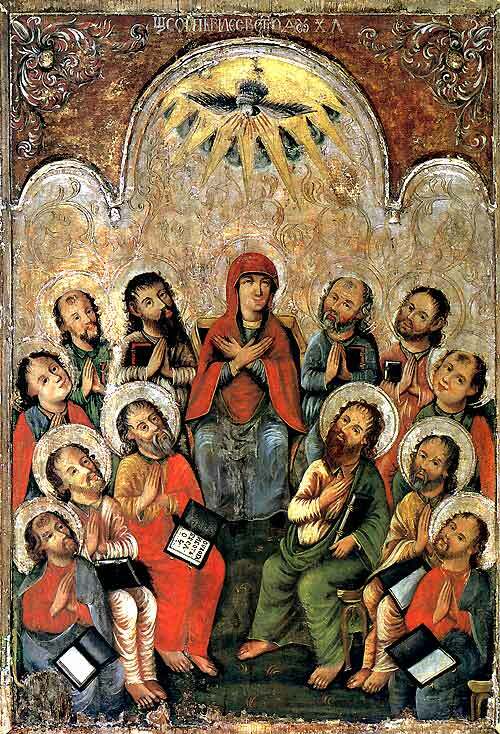 Today in the book of the Acts of the Apostles we read how the apostles were all in one place, suddenly the wind began to blow, divided tongues of fire descended upon the disciples, and they began to speak in various languages. It is sometimes the custom at some churches on the Day of Pentecost to re-create this event by arranging for a simultaneous reading of one or the other of today’s Scripture lessons in multiple languages. Depending upon the linguistic gifts of members of the parish community, someone of Hispanic heritage might read the text aloud in Spanish. Others may join in with their high school French or German, while a recent immigrant from a far-off land speaks in his or her native tongue. The idea of course is to remind everyone of the Day of Pentecost, when people “from every nation under heaven” heard the disciples proclaim the Good News “in the native language of each.” Although fun the problem is that no one is understood. It ends up making about as much sense as those two folks in the noisy room trying to communicate, or using a biblical example, it takes on more the character of Babel than of Pentecost. Do you remember the Tower of Babel from the Book of Genesis? It takes place very early on in human history. After the flood the sons of Noah went out with their wives and repopulated the world. As the tribe grew they stayed together and one day decided to build for themselves a great city. They said, “come, let us build ourselves a city, with a tower that reaches to the heavens so that we may make a name for ourselves and not be scattered over the face of the whole earth.” But the Lord saw this and decided that this was not a good idea. His response, “If as one people speaking the same language they have begun to do this, then nothing they plan to do will be impossible for them.” It wasn’t that God wanted to make the challenge more difficult, this was not the divine version of the “Survivor” TV show, instead God understood that if the human race were able to complete such a task, because of pride, it would soon believe that it no longer needed God. So God said, “Come, let us go down and confuse their language so they will not understand each other,” at which point the people gave up the city, gathered by languages, and dispersed. The place became known as Babel, which sounds like the Hebrew word that means “confused,” and my goodness I think we have been confused and tongue-tied ever sense. What can be misunderstood will be misunderstood. But Babel, that first clash of cultures and failure to communicate, is more than a explanation of the differences among nations and languages. It is an apt description of the human condition itself, because the truth is we often do not understand one another even when we speak the same language. How many arguments have you had with someone over miscommunication? “You say tomato, I say tomato” and all that silliness? Instead of hearing and understanding one another, it is all just a lot of noise. It is as though we were those two people giving goofy hand signals and no one understands anything. It happens on personal levels and and it happens on global levels. We can point to Babel and say, “Aha,” it’s God’s fault that there are wars and so on, but sense we don’t even get along with each other that argument falls apart. Perhaps Babel was when the languages and tribes were divided, but perhaps it also demonstrates something else to us – how we, through our own pride, have lost the ability to communicate with one another. And not only the ability, but the desire. We just don’t want to put out the effort. Too much work. It’s better to stay in my own little world and let the rest figure it out on their own. However, to act in such a way, to say such things is to announce that Pentecost never occurred. It is to declare that the spirit of Babel is still at work in the world and not the Spirit of God. But you and I know that this is just not so. On that first Pentecost the Spirit of God comes down upon the disciples, resting on each of them and thereby bringing them—and us—together once again. The disciples get a crash course in the language of God. It is fair to say that after Pentecost the days of Babel are over. The great differences among us, in communication and dialogue, culture and background, wealth and poverty, are scattered in “the rush of a violent wind.” As Acts tells us, the differences are burned away by tongues of fire. As St. Paul teaches, “There is neither Jew nor Greek, there is neither slave nor free, there is neither male nor female; for you are all one in Christ Jesus.” It does not matter now whether we are Parthians and Medes of old, or Americans, Europeans, and Iraqis of today, and this is made possible through the Holy Spirit of God. That is what is supposed to have happened at Pentecost. We were all given the same Spirit. So, how is that we still fail to understand each other? Why does not everyone speak the same language? Or at least understand the world in the same way? Is the promise of Pentecost hollow and without meaning? Good questions. What happened at Pentecost is important to who we are as followers of Christ, but the reality of Pentecost is universal. The disciples addressed not just believers but the peoples of the whole known world, and they spoke in a multitude of languages. What they said wasn’t Babel. It made sense, because they spoke about God in the language of God. Just as Jesus opened the Gospel message to Cleopas and Luke on the road to Emmaus, so the apostles, through the power of the Spirit, revealed this same message to the throngs gathered in Jerusalem. Yet, perhaps the greatest miracle of Pentecost had nothing to do with all those languages. Perhaps the most remarkable event of that first Pentecost is that the people gathered at Jerusalem actually heard the disciples. In the middle of all the hustle and bustle of the city and the babel of their own lives, not only did the people hear the disciples speaking in their own language, they also heard them in their hearts. Now, as then, all nations and peoples yearn and need to hear the Gospel message, but we live in a world that does not like to listen. We don’t like to listen and truly hear what each other has to say and we don’t like to take the time and truly listen to what God has to say, so instead of being drawn together by the Spirit of God, we are pushed apart by all the noise, by all the babble. That word Shalom – Peace – in this context is not as simple as you might thing, for it is the culmination of the messages of all the prophets. It is the summation of the Gospel and it is the equivalent of Jesus’ words from the cross, “It is finished.” It is God – through Jesus – stating that there is now nothing between Him and us. No longer does sin separate us. Now there is atonement. Redemption. Salvation. Jesus is announcing that peace has been achieved between God and humankind and when you and I realize this, when we truly hear this message as they did on that first Pentecost, then our babel will be transformed into Pentecost. No. I’m not so naïve as to believe that we will establish world peace, even Jesus said that there would be wars and rumors of wars; however, if you, through the power of God’s Holy Spirit, through prayer, and through study will truly listen, not just with your ears, but with your heart as well, then you will have the opportunity to experience this peace in your own life. It’s going to take a bit time and work, but it can be yours.